Researchers at the École Polytechnique Fédérale de Lausanne (EPFL) in Switzerland revealed that they have created the first bionic arm capable of simulating the sensation of feeling. Professor Silvestro Micera of the EPFL revealed today his research into just such a prosthetic hand, which he believes can restore a degree of motor control and the sensation of touch to patients. The arm accomplishes this feat by intraneural electrodes implanted into two major nerves in the patient's arm, the median and ulner nerves. "We could be on the cusp of providing new and more effective clinical solutions to amputees in the next years," Micera said. The arm was tested by a 26-year-old patient, who lost half of his arm in an accident. 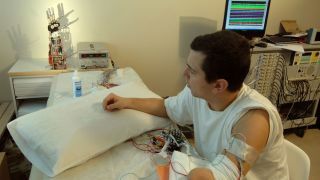 Electrodes were connected to his arm while the artificial limb rested on a nearby table, and Petruzziello was able to perform simple motions like flexing the prosthetic hand and grasping objects. More amazingly, he was able to feel the sensation of gripping objects with the bionic arm, and was even able to feel a needle prick on the prosthetic's palm. The tests were part of a four-week trial using an earlier model of the bionic arm in 2009, which was only outfitted with two sensory areas. According to a report by The Independent, the next stage in the research will be for a month-long trial with the patient actually wearing the arm, and with sensory inputs for each finger as well as in the palm and wrist. As with all artificial limbs and transplants, there is the risk of the body rejecting the new appendage. However, Micera said he believes that by having the bionic arm replicate touch sensations it will help the artificial limb take to patients more naturally. "It is clear that the more sensory feeling an amputee has, the more likely you will get full acceptance of that limb," Micera told an audience at a recent American Association for the Advancement of Science meeting in Boston. Should the month-long trial be a success, this could be a significant advancement in prosthetics research, offering the hope of some returned dexterity and feeling to amputee patients. The bionic arm will still have other hurdles to overcome, such as a method of hiding the wiring under the patient's skin. However, Micera claimed that if the month-long test succeeds a more complete bionic arm model could be ready for testing in the next two years.